“Nori,” as she is known, is a friendly people-person, whom you would never know spent most of the last 8 years homeless, living in abandoned buildings, motels, and here and there with friends. She’s lost 50 pounds since beginning to play on the soccer team. She's learned to manage her bipolar disorder, and she's moved into an apartment this year with a teammate. Soccer seemed like a crazy idea to Nori, but she was impressed with the people on the team and what they were achieving off the field, so she gave it a whirl and it worked for her. 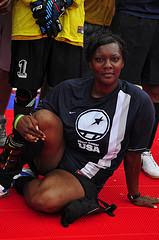 The Charlotte team, Street Soccer 945, is run by Pete Fink, out of the Urban Ministry Center, and is the founding program and agency of Street Soccer USA. Make an online donation during the month of September and receive a free, red, SSUSA supporters' bracelet.